The bonsai trees are back out in their courtyard at the Chicago Botanic Garden. I went there today to teach my class on Calligraphy and Floral Decoration, and it was hard to walk through the garden to my classroom without “stopping to smell the roses”. 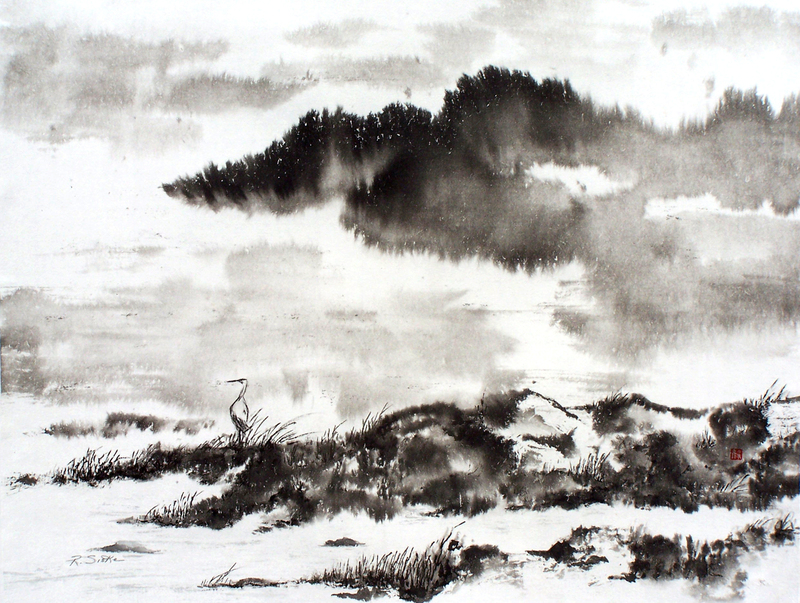 After three hours of demonstrating how to twist and turn the brush to evoke the vitality of living things in sumi ink, I walked outside to see the real thing. 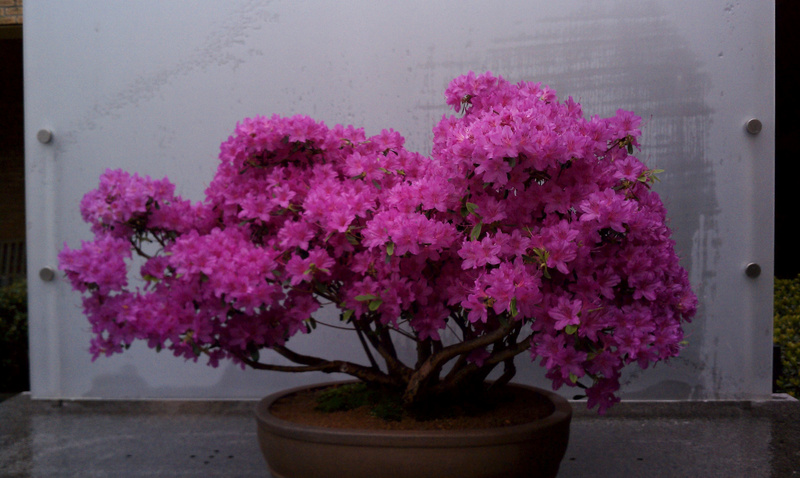 I came upon this ostentatiously robust bonsai azalea tree. I’ve felt some ambivalence about bonsai, ever since Ted and I followed the signs to an artist’s ceramic studio while visiting wine country in Sonoma County, Callifornia. The signs said “Pottery and Bonsai”, and sure enough, the studio had pots and little trees. I’ll never forget overhearing a guy say, “I hate bonsai– they torture the trees, man!” Which may be true, inasmuch as one can torture a vegetative life form. But, we human beings also submit ourselves to torture for the sake of art and beauty– bonsais are the ballerinas of the plant world. They’re trees in tiny toe shoes. Even calligraphers can be tortured for their art. During months of physical therapy to untie the knots I created in my neck by spending hours hunched over my drafting board, my physical therapist told me that I’d been in training like an athelete, only I had trained my body to be deformed. After so many three-hour painting and calligraphy shifts, I actually felt I was turning to stone, like a gargoyle. I contemplate my output, what must be miles of border designs and lines of lettering that would stretch from here to Milwaukee, and sometimes I wonder just how much a person must paint. And I answer myself, until she drops. But, at least she can stop to smell the azaleas.